Services exports from Asia-Pacific least developed countries (LDCs) are growing in volume and should be further encouraged as they can contribute towards export diversification and development. 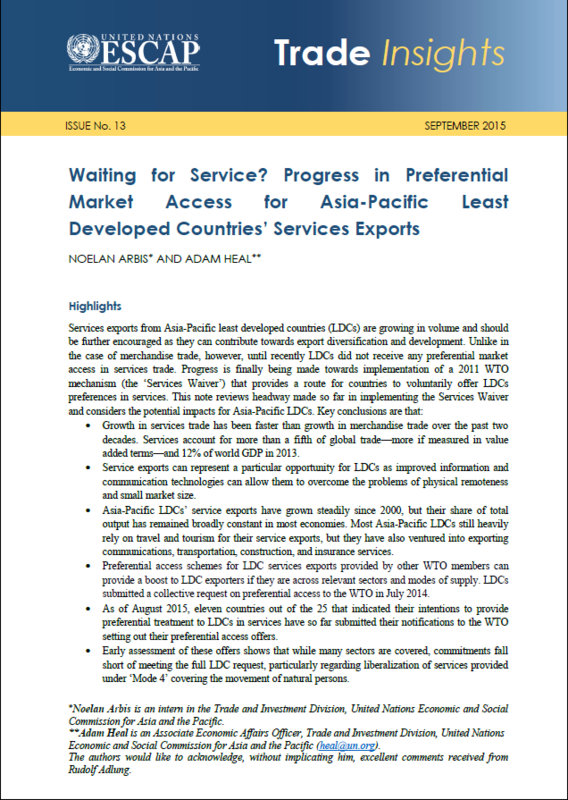 Unlike in the case of merchandise trade, however, until recently LDCs did not receive any preferential market access in services trade. Progress is finally being made towards implementation of a 2011 WTO mechanism (the ‘Services Waiver’) that provides a route for countries to voluntarily offer LDCs preferences in services. This note reviews headway made so far in implementing the ‘Services Waiver’ and considers the potential impacts for Asia-Pacific LDCs.